These tacos have become my standby for having people over. They are fun and festive and surprisingly easy to prepare. And let’s not forget, extremely delicious. 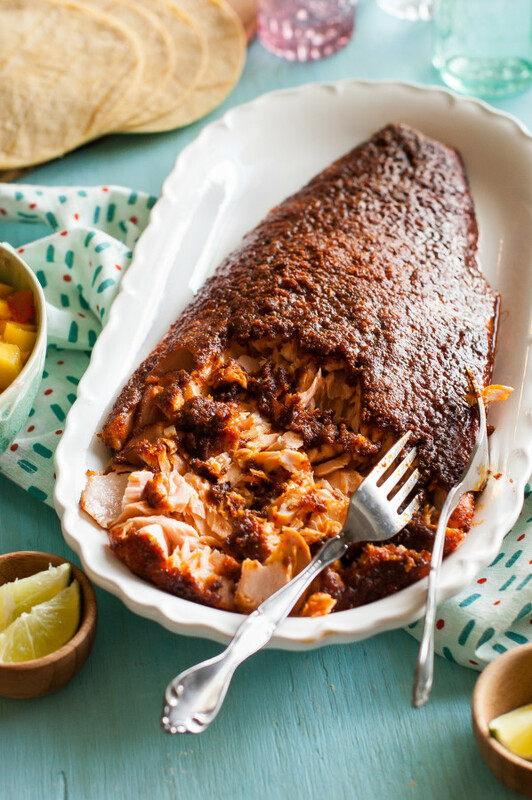 The salmon is the star and packs a ridiculous amount of flavor thanks to the spice rub that coats it. It’s a little sweet, a little spicy, and a bit smokey thanks to a decent amount of smoked paprika. Smoked paprika has been one of my favorite spices recently. If you don’t have any on hand, get some. Not only is it fantastic in with dish, but it makes a mean barbecue sauce. 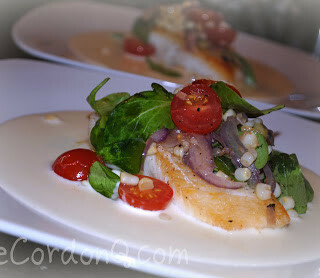 Another reason I like to serve this dish to groups of people is the presentation factor. I mean, look at that salmon fillet just sitting on that platter in all of it’s spice-crusted glory. 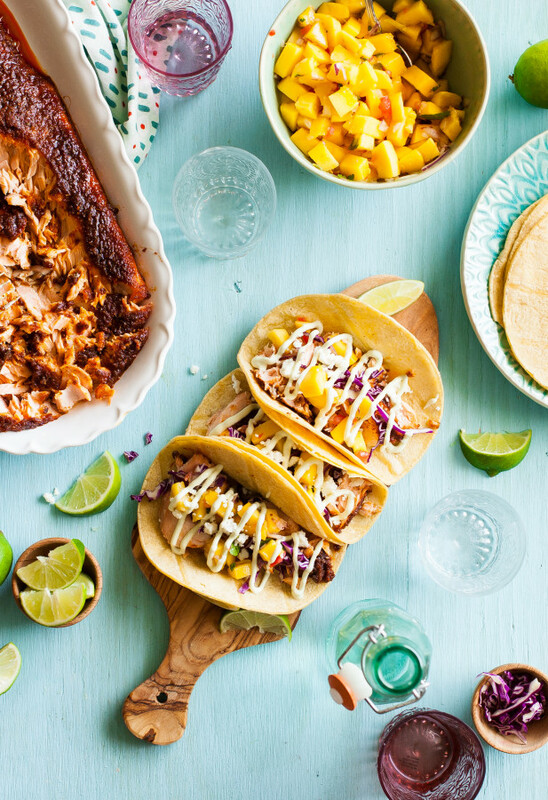 It pairs so well with the sweet mango salsa and the tangy avocado lime crema. 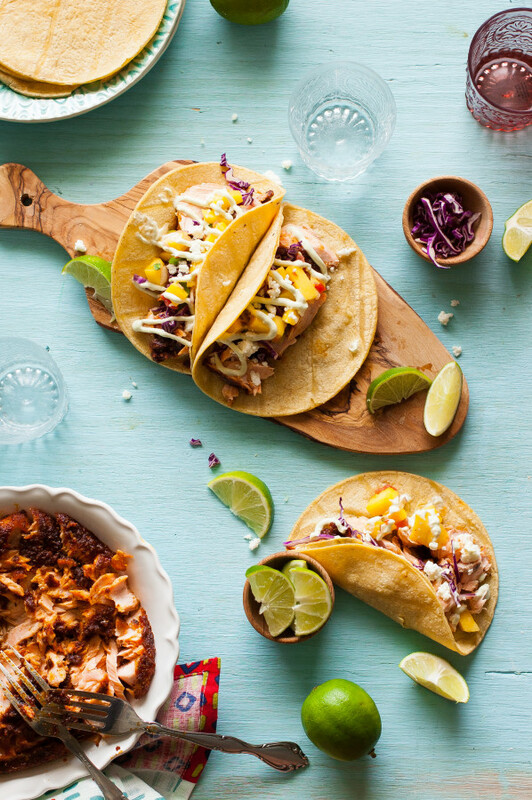 When you add in all of the other taco topping the spread becomes one colorful, flavorful feast for the eyes. The mango salsa is simple. I dice a few fresh mangos and mix in a little fresh pico de gallo that I get pre-made at our local market. I love using the pico de gallo because it is just as fresh as if I had cut it up myself, yet it saves me a lot of time. 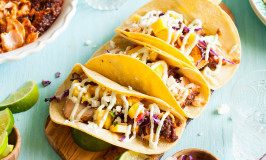 If you have one, spoon the avocado lime crema into a squeeze bottle so that you and your guests can easily squeeze it out on top of the tacos. If you don’t have one, spooning it on will work just fine. Preheat the oven to 375 degrees. 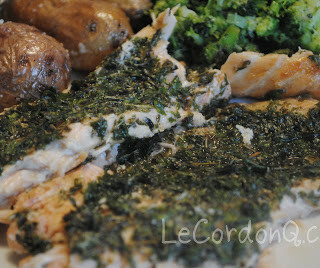 Place the salmon fillet on a parchment lined baking sheet. In a small bowl, mix together the smoked paprika, cayenne, chili powder, garlic powder, onion powder, cumin, salt, brown sugar, and olive oil to form a paste. Rub the paste on the salmon until is is completely coated. 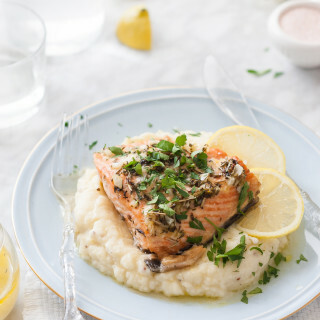 Bake the salmon on the top rack of the preheated oven for 20-25 minutes, or until it is fully cooked and flakes easily with a fork. 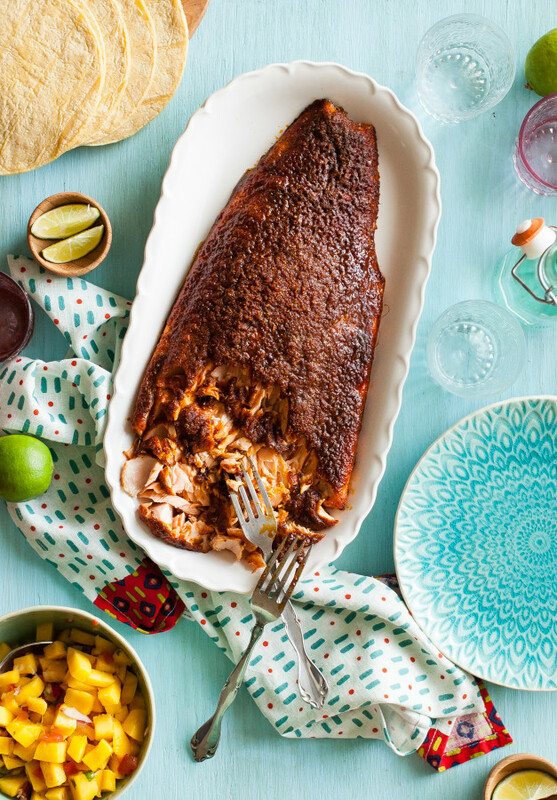 While the salmon is baking, Combine the mango and pico de gallo in a small bowl. Add the avocado, lime juice, and sour cream to the bowl of a food processor. Blend until smooth. Slowly blend in the heavy cream until the mixture is runny enough to fall easily off a spoon. You may need more cream, depending on how thick your's is. Different brands tend to have different consistencies. Add salt to taste. Spoon into a squeeze bottle. 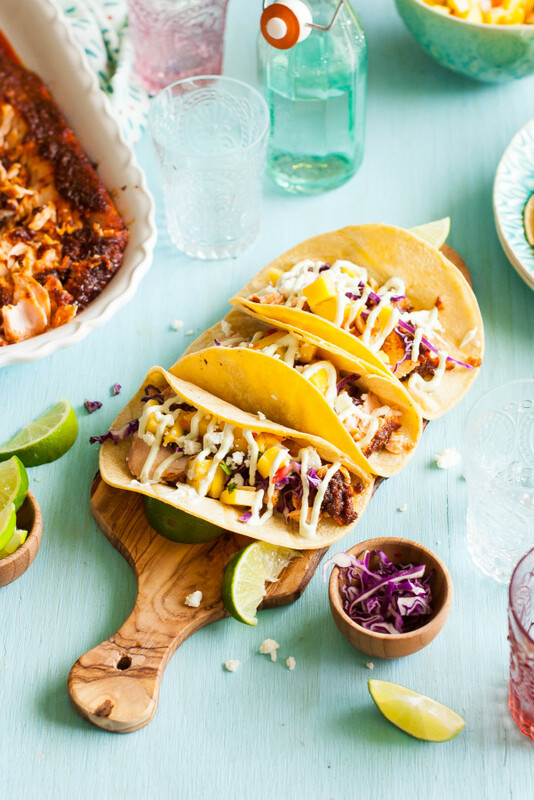 Serve tacos with the mango salsa, avocado crema, cliantro, queso fresco, lime wedges, and shredded red cabbage.